PAROC LF1 Tape is an reinforced aluminum tape with a grey color lacquer finish and a modified acrylic adhesive with siliconized liner. It is ideal for sealing the joints when using PAROC Marine LF1 faced products such as sections, lamella mats or slabs. The product for sea going vessels complying with IMO FTP Code (ref. Ch. 5.2.1 and Ch. 8), Annex 1 part 2 and part 5 (IMO Resolution MSC. 307(88) Annex 1 Part 2 and Part 5).PAROC LF1 Tape gives a great finish and safe installation. Rolls / box: 7 pcs, boxes / pallet: 24 pcs. During the installation, the insulation material to be taped should be at a minimum temperature of +5 Celsius. Allow the temperature of the insulating material to adjust to the ambient installation temperature. 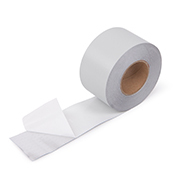 Make sure that the surfaces to be joined with tape are clean, dry free of dust and grease.Surface must be free from oil, fat, dust and solvents before film/tape application. Do not use cleaners containing anti-adhesive agents. Some plastics and paints may discharge anti-adhesive agents leading to bonding failure. Rough and uneven surfaces may weaken bonding. Product should be stored in original packaging, laid flat on the slit edge of the roll. Storage in dry and clean areas, at normal temperature, protected from direct sunlight and heat sources. We strongly advise users to test the product‘s suitability for their own particular requirement. All data and recommendations contained in this Technical Data Sheet are based on our own test results and practical experience and are aimed at helping customers select the appropriate tape for a given application. This information is provided without liability. We reserve the right to change the technical specification without prior notice.